What fine art galleries in Manhattan, NYC do you know? Most likely, the renowned Gagosian Gallery, David Zwirner Gallery, Pace Gallery, Sperone Westwater Gallery, and Luhring Augustine Gallery are the first that come to mind. However, the truth is that Manhattan is full of amazing art galleries for any taste. At Fine Art Shippers, we are very proud to work with many of them, shipping and packing outstanding art pieces for them and their clients on an ongoing basis. Besides, each member on our team of professional art handlers in NYC is a true connoisseur of fine art, so we never miss a chance to visit different art galleries in Manhattan and other New York City boroughs, most of which offer absolutely stunning pieces by some of the world’s most significant contemporary visual artists. 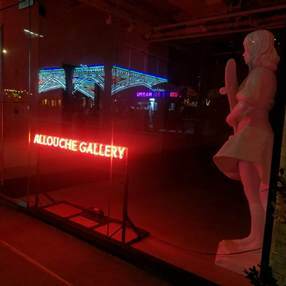 For example, you should definitely visit Allouche Gallery located at 82 Gansevoort Street! Highly recommended by our art shipping and packing company! Allouche Gallery was founded in 2014 by Eric Allouche who is also a partner at the world-known Opera Gallery. This beautiful art gallery quickly became one of premiere commercial art galleries in New York City, offering works by the world’s most recognized contemporary artists. For today, Allouche Gallery represents such incredible talents as Paul Insect, Faile, Ron English, and Jessica Lichtenstein, as well as offers artworks by many prominent artists, including Jean-Michel Basquiat, Andy Warhol, and Keith Haring. It is indeed a must-visit art gallery able to impress even experienced art shipping and packing specialists!